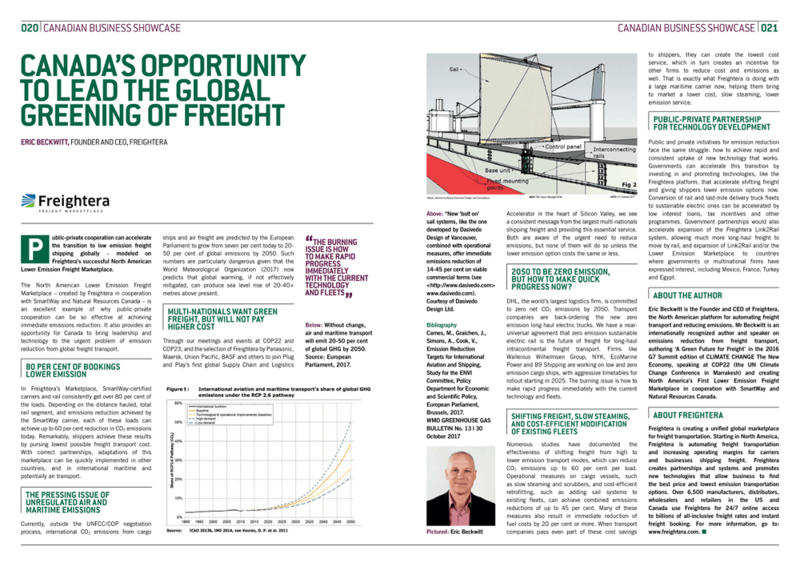 Freightera CEO Eric Beckwitt’s article about how Canada can lead in greening global freight transportation was just published in the La Malbaie, Quebec G7 Summit edition of CLIMATE CHANGE – the New Economy (CCTNE). 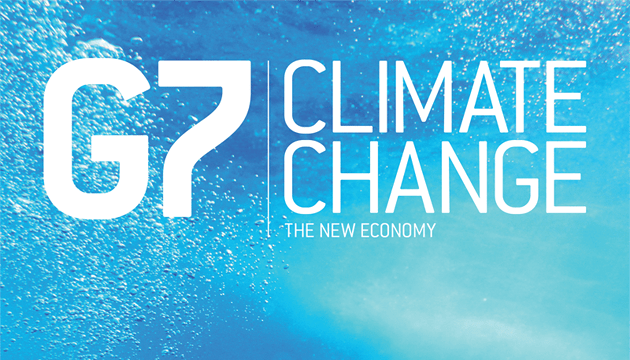 CLIMATE CHANGE – the New Economy is the leading climate change publication supporting the G7 2018 Summit. In the publisher’s words, it’s “brimming with bold leadership from some of the world´s top innovators and visionaries”. In it you will find how leaders and experts are addressing the challenges and identifying innovative solutions for cleaning the oceans, how cities should be leading the energy transition, and, in the case of Freightera, how we can accelerate the transition to low emission freight shipping. The CCTNE G7 issue includes official statements from Canadian Prime Minister Justin Trudeau, Canadian Minister of Environment and Climate Change Catherine McKenna, and Patricia Espinoza, Executive Secretary of the UN Focal Committee on Climate Change and other G7 heads of state. It will be distributed at the Summit locations to the participants. In his article, Eric Beckwitt draws attention to the opportunity for Canada to bring leadership and technology to the urgent problem of emission reduction from global freight transport. He uses the example of Freightera’s North American Lower Emission Freight Marketplace, created in collaboration with SmartWay and Natural Resources Canada, to show how public-private cooperation can be effective at achieving immediate emissions reduction. “In the Lower Emission Marketplace, SmartWay certified carriers and rail consistently get over 80% of the loads. Depending on the distance hauled, total rail segment, and emissions reduction achieved by the SmartWay carrier, each of these loads can achieve up to 60% reduction in CO2 emissions today. Remarkably, shippers achieve these results by pursuing lowest possible freight transport cost. With correct partnerships, adaptations of this marketplace can be quickly implemented in other countries, and in international maritime and potentially air transport,” states Eric Beckwitt. The article also describes the state of the global greening of freight and uses examples of how businesses are getting involved. DHL Group committed to their mission of “Zero Emissions by 2050” and found itself going into the impressive extra-mile and successfully innovating in design and manufacturing of their own electric delivery vehicles. Meanwhile, Dasivedo Design in Vancouver, Canada, is looking for investors to fund their clean shipping innovation – a modern sales and rigging system for retrofitting existing old merchant ships, tankers, and bulk carriers and giving them wind power. “As a very influential and powerful group of nations, the G7 has the potential to make a key contribution,” said Patricia Espinosa, UNCCFC Executive Secretary, regarding the upcoming G7 Summit. “What governments have traditionally done are fines and regulations that most of the time is met with dismay or controversy in the business community,” said Eric Beckwitt, “What they need to get better at is in supporting businesses innovating in renewable energy and low and zero emission transportation as well as incentivizing emissions reduction.” Thankfully more and more businesses get it right – energy savings and reduced emissions go hand in hand.